Spiritone Records proudly represents these fine artists. Mare Edstrom is a blues vocalist with eight solo albums to her credit, all released on Spiritone Records and produced by Kenn Fox. Mare’s wide vocal range, energy, and vintage brand of roadhouse authenticity have been duly noted by critics again and again. Mare performs mostly in the Milwaukee area, as duo with collaborator/producer Kenn Fox on guitar or with the Mare Edstrom Blues band. Her music has been aired on blues radio around the world and she has performed two television concerts with her band. Description: Contemporary Celtic music with a traditional edge. Members: Mare Edstrom- Fox, Vocals, Flute, Keyboards, Kenn Fox, Guitars and Bouzouki, Dave Karnes, Guitars and Bouzouki, and Tracy Moraine, Vocals, Percussion, Keyboards with a host of talented guest players on their recordings. Contact Kenn at 608-513-1158 for bookings. Kenn Fox has been a viable component of the Midwest music scene for nearly 30 years. With numerous recordings to his credit (solo and with Mare Edstrom), he is known as a guitarist, composer, studio artist, producer and teacher. 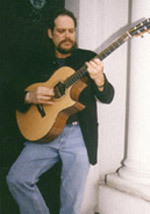 As a guitarist, Kenn is acclaimed for his explorations of many styles, including modern fingerstyle, electric blues, slide guitar, and world fusion. He is a proponent and innovator in the use of open guitar tunings, using dozens of self-invented tunings both live and on recordings. Kenn works regularly with blues vocalist Mare Edstrom (above), as collaborator/producer and as performing partner. Kenn also is an instructor with a thriving studio at Hartland Music/The Waukesha County Conservatory of Music where he teaches all styles of guitar. Kenn is also owner of Paramount Guitars, a unique instrument store specializing in handmade guitars. 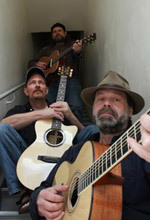 The Midwest Guitar Trio is, simply stated, a celebration of the guitar. Kenn Fox, Dave Karnes, and Richard McKay weave a variety of sounds, styles and influences into a unique and exiting journey through the history of modern guitar. Their deep repertoire features British and American Folk Instrumentals, Celtic ballads, Ragtime, Gypsy Jazz, Swing, a few of their favorite Chet Atkins tunes, and a hearty array of original compositions. The arrangements are intricate and fun, showcasing both their mastery as players, as well as their respect for the music and its origins. 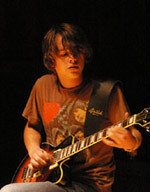 Andrew Edstrom is a young guitar sensation from Wisconsin. Toothpick Elbow began life in LA in 1999 when Todd Westover, drummer of the BellRays, put out a collection of home recordings, calling it Toothpick Elbow. The release instantly started generating a buzz and Todd decided to revive the solo performances - a fuzzed-out electric piano, a lamp and him - that inspired the recording to begin with. 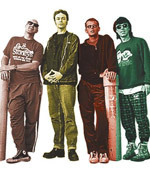 Soon after, a band was formed which has varied in membership over the years, and has included greats such as "Dallas" Don Burnet, Jeff Porterfield, Chris Miller, Tony Fate, John Ramirez, Mike Sessa, Vince Meghrouni, and Eric Hermann. Kenn Fox produces these collections which feature notable Wisconsin artists and offer a wide range of musical styles. Participants have included notables such Peter Mulvey, Don Conoscenti, Holly Brook (now known as Skylar Grey), Jack Grassel, Bill Camplin, Mare Edstrom, Tracy Jane Comer, Ralston Bowles, Tim Angsten, Todd Westover, Simon Stokes, Piper Road Spring Band, and Mrs. Fun.